The album was anchored by the international hit "Do You Really Want to Hurt Me". The album's first two singles were "White Boy" (which failed to crack the US or UK top 100), and "I'm Afraid of Me" (which peaked at #100 in the UK). But with the release of "Do You Really Want to Hurt Me", the band scored a hit in over a dozen countries. Next single "Time (Clock of the Heart)" became a US and UK top ten hit. This song appeared on US versions of the album but not initially on the UK version. Another single was released in North America, "I'll Tumble 4 Ya", which went top ten in the US. This made Culture Club the first band since The Beatles to have three top ten hits in America from a debut album. Kissing to Be Clever was remastered and re-released in 2003 on CD. 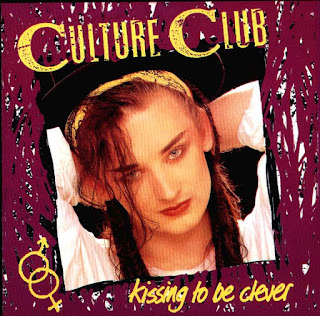 This edition contains the song "Romance Beyond the Alphabet", which is the orchestral instrumental version of "Time (Clock of the Heart), also included on Culture Club Collect – 12" Mixes Plus and its subsequent re-release Culture Club Remix Collection as "Time (Clock of the Heart) (Instrumental Mix)". It has the restoration of the original color cover. The color cover had been replaced by a black-and-white version (as seen here). The album has sold approximately 2.5 million copies worldwide, which includes about 1.5 million of those in the USA, where it was certified platinum by the RIAA.